A handsome print, engraved by William Sartain (1843-1924), one of the leading engravers in the mid-19th century. It is after an oil-on-canvas by Sartain’s contemporary and painting instructor, C. Schussele. The scene depicts George and Martha Washington seated at a table, with their adopted grandchildren George Washington Parke Curtis and Nelly Curtis standing nearby. Washington is depicted in full uniform with his dress sword and hat atop a nearby chair, an allude to his strong military character. A book held partly open in his left hand and the map of the Nation’s Capital on the table in front of him in turn denote his insightful decision-making and strong presidential character. Martha Washington is pointing with her hand to the “grand avenue,” now known as Pennsylvania Avenue. A servant overdressed in livery and ornately decorated formal room complete the imaginary scene. 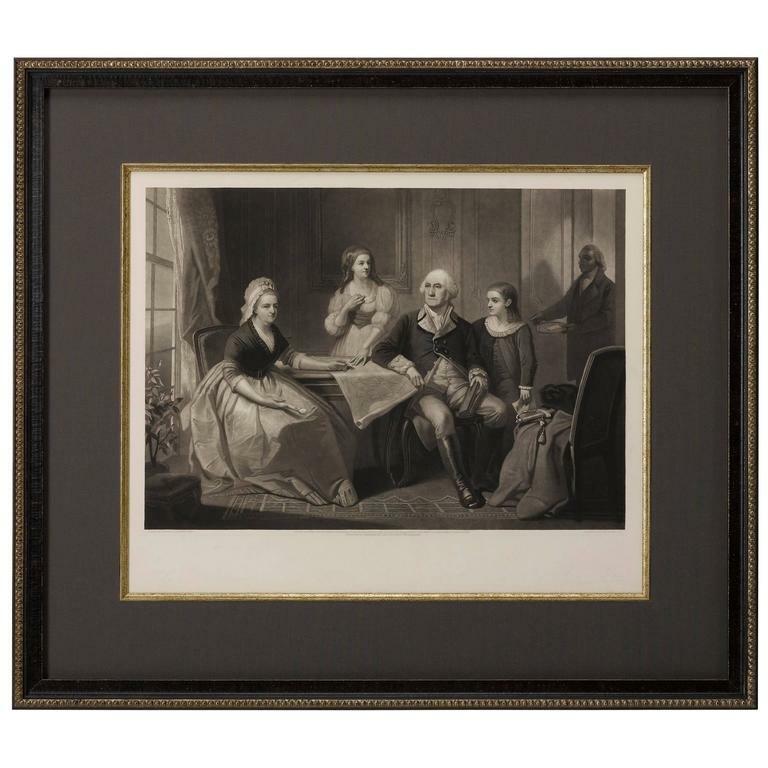 There have been prints depicting George Washington with his family since the 1790s, when self-taught artist Edward Savage painted an impeccable study of the family Edward Savage's. Savage’s 1796 The Washington Family quickly became a veritable icon of our early national pride, leading to numerous engravings and prints. Engraved depictions of our first family were especially numerous in the years surrounding the Civil War when political animosities were rampant. 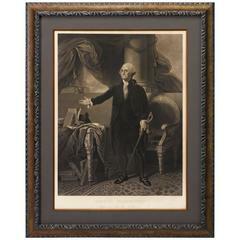 Such prints presented scenes of domestic tranquility, and well as a respectful reminder of our country’s founding. The print was published by Bradley & Co, in Philadelphia,1865. It has been archivally framed with a dark grey mat, conservation glass, and a custom-built black and silver beaded frame.